Balloon flight in Stockholm is a company flying hot air balloons in the Stockholm area. We have over 30 years experience in flying hot air balloons in different sizes from 2 up to 22 people in one basket. We usually fly 6-12 persons in our ballons. We fly our balloons mostly in Stockholm, but can on special interest exists, go to any other city or community where you want to see their own countryside from the air. 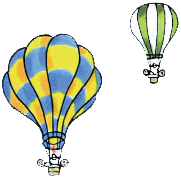 We train new balloon pilots and has over the years trained dozens of swedish balloon pilots. The price include transport, insurance and champagne that we drink and be baptized in. Everyone will also receive a diploma as a memory of the flight. We send the balloontickets, brochures and invoice immediately. No additional fees will be added. VAT is included in the price.